With its unique mix of mirror-flat fjords, rugged coastline and wildly beautiful islands, Norway is the ideal place to explore by kayak. Swapping the cruise ship for this more humble vessel will get you close to nature, giving you a more intimate glimpse into this country’s vast and wonderful waterways that are bursting with wildlife. Nothing beats the feeling of quietly paddling through a pool of deep blue, flanked by towering cliffs, or gliding past icebergs and glaciers in the remote Arctic Circle. With so much water on hand, it’s easy to see why this sport is in Norwegians’ blood; in summer, locals kayak on inland lakes and rivers to reach secluded summerhouses or simply to wild camp in the 24-hour daylight. From the lesser-known spots to some of the country’s best-loved gems, here’s our pick of the best places to kayak in Norway. 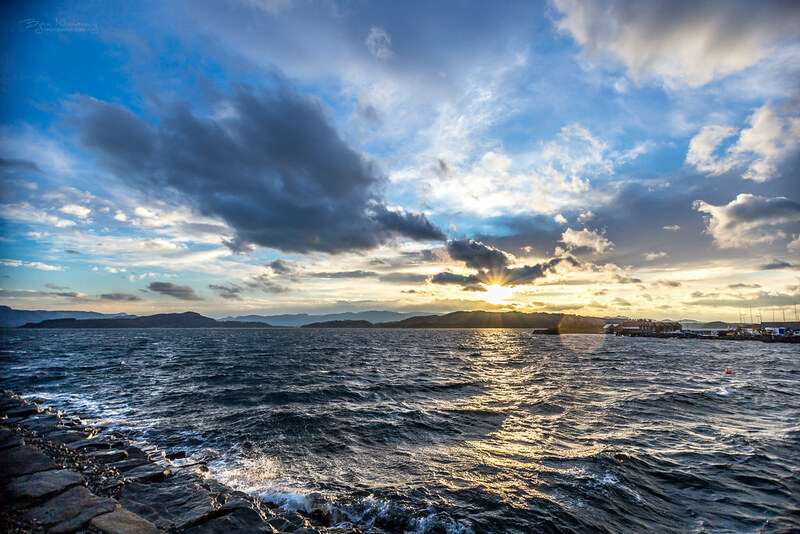 Ideal for those looking to add some adventure to a city break, Oslofjord’s waterways and islands are conveniently located just minutes away from the centre. This is a great option for first-time paddlers looking for an intro into the sport, and will give you a taste for what the rest of the country has to offer. The 100km-long fjord – a protected area of sea dotted with islands of varying sizes – is home to a wide range of activities, including sailing, fishing and swimming. But kayaking is arguably the best way to reach the numerous beaches and isles surrounding the city, instead of catching one of the island-hopping ferries that can be packed in summer. Escape the urban bustle and see the city with an otter’s-eye view, getting in some exercise as you immerse yourself in nature – with the city skyline in the distance. Kayaking amid towering cliffs of the world-famous, UNESCO-listed Geirangerfjord is extraordinary. At sea-level, the surrounding walls of the 15km-long fjord with its tumbling waterfalls seems impossibly vast. The deep blue water reflects the tree-clad mountains, creating a deep emerald colour. 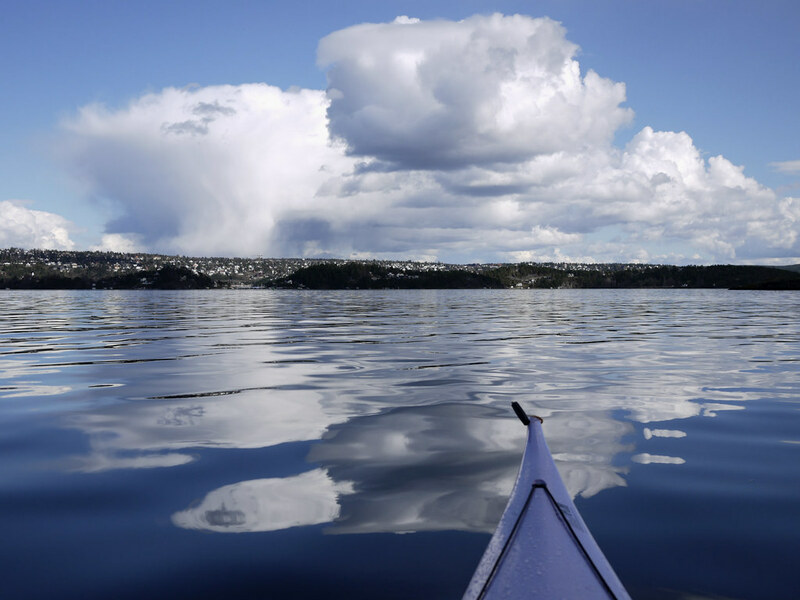 Kayaking offers a far more peaceful way of experiencing the fjord than boarding the car ferry – and after a few strokes your mind starts to ease. Paddle past abandoned farms with the odd grazing goat, and venture right up to the Seven Sisters Falls, feeling the tumbling water spray your face as you edge closer to the famed cascade, something you can only do from a kayak. The village of Geiranger is also home to some excellent walking trails, so this is a good option for travellers looking to combine kayaking with hiking. Rising 1,000m out of the sea, this mountainous archipelago with shimmering seas has wilderness just around the corner – yet civilisation is reassuringly close at hand. The hidden inlets, white sand beaches and sweeping rock faces are best explored by water – which is warmed by the Gulf Stream – and kayaking between the islands is the way to go. The main islands – Austvågøy, Vestvågøy, Flakstadøy and Moskenesøy – are separated from the mainland by Vestfjorden, famous for its cod fishery and orca population in winter. These islands get busy in peak season, so try one of the smaller islands, such as Skrova, for epic views without the crowds. The fjords and island groups are more accessible for the first-timer than some of Norway’s more remote spots, yet they also boast some of the country’s finest scenery and wildlife. With its dramatic mountain landscape, kayaking trips can also be paired with climbing and mountaineering. Known as the riviera of Norway, Hidra, near Flekkefjord, is a beautiful island with a rich maritime history. The island, located where southern and western Norway meet, dates back to the times of legendary Vikings, and artefacts can still be found today. The island is split by the Rasvågfjorden, while the Eie Canal – with its calm, kayak-friendly waters – was built through the remaining isthmus for small boats to pass through. Here you can glide through narrow channels lined with the island’s white-painted clapboard church and colourful boathouses, or paddle between the fishing villages of Rasvag and Kirkehavn, where a number of small isles are scattered through the sea. Halfway between Norway and the North Pole, Svalbard is about as remote as it gets. This is a wondrous archipelago of snowy peaks, untouched glaciers, the Northern Lights and where polar bears outnumber people. In summer the midnight sun arrives, bringing with it long days that are perfect for paddling. Choose from shorter trips around Longyearbyen, the world’s most northerly town, and multi-day trips including overnight accommodation in wooden lodges. 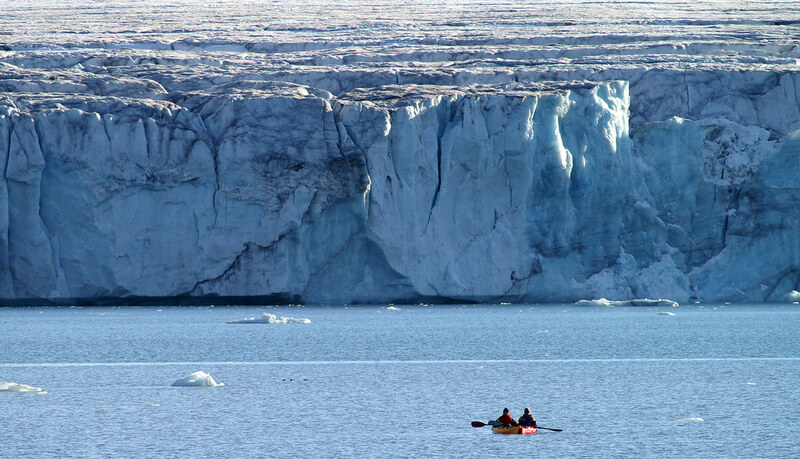 Wearing a warm dry suit, you can’t help but feel a sense of peace and stillness in this true Arctic wilderness as you navigate neon-blue glaciers and push misshapen lumps of ice with your oar. When your arms are tired, pull your kayak ashore and explore the abandoned settlement of Hiorthamn on foot, or lace up your walking boots for a mountain hike, keeping your eyes peeled for whales and reindeer. A great choice for keen twitchers, Finnøy Island, located in an easily accessible area between the cities of Haugesund and Stavanger, is known for its stellar bird watching opportunities. The island is home to a protected bird sanctuary that is teeming with different seabirds, such as the white-tailed sea eagle – Europe’s largest bird. As entering this area is prohibited, the best way to glimpse the wonderful animals and wildlife is in a kayak. Just make sure you enjoy the view from a distance and don’t disturb the birds. The island also has a strong agricultural heritage – it grows around 40% of Norway’s tomatoes and has an annual tomato festival. Want to see it for yourself? 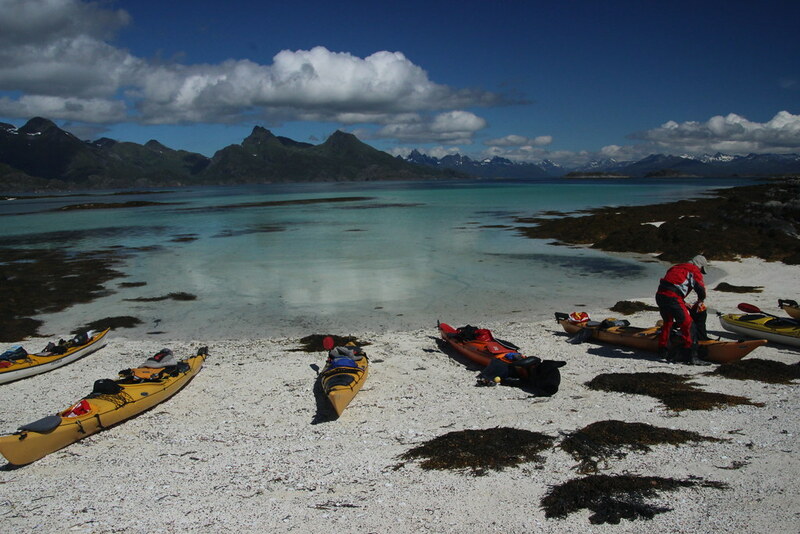 Discover the Fjords with our kayaking experiences and other Norwegian adventures.